This always seems to cause the most confusion for Buyers. Many Buyers think that “waiving” the inspection contingency means not doing one. We would never recommend a Buyer skip doing an inspection, even on new construction. If the home is expected to be a bidding war, we would suggest the Buyer do a “pre-inspection” – meaning they would do the inspection prior to submitting an offer, so if they find the inspection satisfactory, they can then “waive” the inspection. If the inspection unveils serious foundation issues, or expensive repairs, the Buyer may decide to not submit an offer. A home inspection costs around $350-$600 and a sewer scope costs around $250, so one important thing we do as your agent is a CMA (comparable market analysis) to set expectations on what your chances of winning is before you spend $750 on pre-inspections. Many buyers think if you’re buying a brand-new house that you don’t need to do an inspection. We always advise doing an inspection especially on new homes because there are so many contractors working on the house, it’s easy to miss something. Many common issues we see are roof installation problems, water in the crawl space, minor plumbing and electrical issues, windows that need adjustment or replacement, etc. In most cases, the Builder will fix/address any issues that come up on the inspection. Buyers should also do an additional home inspection at the 11-month mark before the 1-year builder warranty expires. This will be your last chance to have the Builder fix minor (or major) issues. Since new construction homes don’t have a history, it’s very important to keep a careful eye on how the home functions in that first year – things like settling and nail pops, drainage, and heating to name a few. It can seem confusing to people why there are multiple agents involved and who does what. Often times buyers think they have the “competitive edge” if they work directly with the Listing agent or the new construction representative. This can’t be further from the truth! The problem is the listing agent or new construction representative both have fiduciary responsibility to represent the seller, in turn, they will never be able to truly have the Buyer’s best interest in mind. The Listing Agent represents the seller, so they will not be able to help you negotiate the best possible price, terms & conditions on a home. When you buy a new construction home, you definitely should use a Buyer’s agent to help you negotiate with the Builder, but more importantly, to help you understand the pre-sale process, what the risks are with your earnest money and financing, builder delays and how that can affect you. There is additional Builder paperwork that our real estate attorney will review on your behalf (free of charge). Agents are not allowed to give legal advice on non-NWMLS forms. Many buyers think agents are all the same. In reality, there is a huge difference between skill level, expertise, service, and support. Just because someone has been in the business for a long time doesn’t mean they are more skilled. 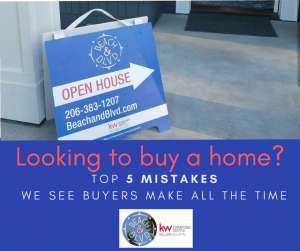 Just because someone is new to the industry doesn’t mean they are less skilled – often times newer agents are a better choice since they have more time and they have partnered with more experienced agent. In any case, make sure you interview several agents to see which one is the best fit for you. Make sure you choose an agent that will do an in-depth buyer consultation, and one that will work exclusively on your behalf. Picking the right agent in this competitive market can mean the difference between success and failure. What is your success rate & strategies for winning bidding wars? Are you able to help me find a home off-market? Is there a place I can read your client reviews? How would you recommend I prepare for buying a home?